Garlic mustard is a very invasive weed. The roots exude a chemical that is inhibit other plants from growing, and it can grow in full sun or full shade, making it a threat to a wide variety of our native plants and habitats. Each plant can produce up to 5000 seeds which remain viable in the soil for five years or more. All of these traits allow garlic mustard, once established in an area, to rapidly reproduce and spread, excluding native and landscaping plants while spreading quickly across the landscape. Garlic mustard can completely smother native plants on the forest floor. 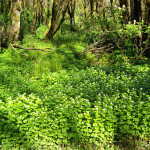 Unfortunately, Multnomah County has the worst infestation of garlic mustard in the state. With garlic mustard already well established in many areas, early detection and eradication of satellite populations has been identified as our primary goal. Imagine your favorite wildflower hike in the Columbia River Gorge or your back yard destroyed by this plant and you can understand the urgent need for control. Garlic mustard flowers grow in clusters at the top of tall flower stalks. Individual flowers are white with four petals. 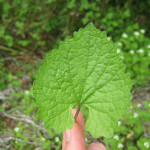 Garlic mustard leaves have scalloped edges and form a sort of heart shape. Garlic mustard (Alliaria petiolata) is a biennial, meaning each plant lives its life over two growing seasons. Seedlings emerge in early March, forming a rosette of leaves the first year. 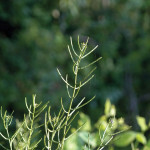 The leaves are alternate, triangular to heart shaped, have scalloped edges and give off an odor of garlic when crushed. The odor can be used to distinguish garlic mustard from native plants like evergreen violet (Viola sempervirens), piggy-back plant (Tolmiea menziesii), fringecup (Tellima grandiflora) and non-native plants such as silver dollar plant (Lunaria annua). Garlic mustard also has a distinct “s” shaped curve at the base of the stem. Garlic mustard flowers during the second year of growth. In March and April of the second year, plants send up a flower stalk from 12 to 48 inches tall, topped with a cluster of white, four petaled flowers. The seeds form in narrow, green seed pods that originate from the center of the flowers and turn brown as the seed matures. The plant dies after producing seed and the brown, dried out stem with the brown seed pods remain through winter. 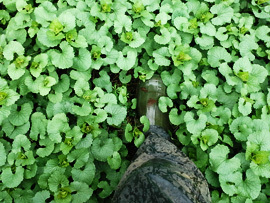 Mowing is not an effective way of controlling garlic mustard! Seed pods, shown here, can be spread to new areas by mowing. Please see below for reporting locations of this species and finding out if you are in an area where free control is available. If you live in an area where free control is not offered, control options follow. All control measures will have to occur annually until the seed from previous years is exhausted. Until you can easily identify the rosette stage of the plant, control is most practical when plants are in bloom. Hand pulling or spraying are the best control options. Hand removal is only successful in small patches that can be visited often and re-pulled frequently. Mowing is not an effective control because plants will still bolt and seed. 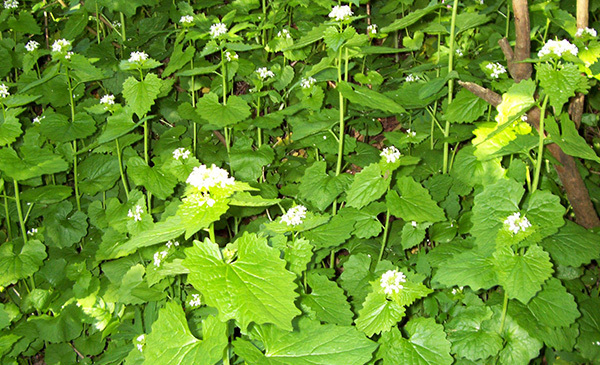 To prevent spreading, do not mow garlic mustard when seed pods are present (May-September). Pulled material will complete flowering and set seed, so be sure to bag and dispose of pulled plants. Garlic mustard is completely taking over the ground in this shot. Herbicides can be used for large infestations, but should be used very cautiously to avoid damage to desirable native vegetation. Spray applications that kill the native vegetation in areas where garlic mustard has gone to seed in prior years will only result in less competition for the garlic mustard that germinates the following year. 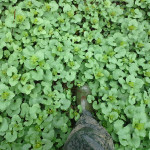 Herbicide will not kill garlic mustard seed. Herbicide treatments should be made to garlic mustard plants as they are bolting or are in early flower stage (typically early April through late May). Herbicide applications should always be followed up with hand pulling a few weeks after spraying to remove all plants that were missed by the spray or grew after spraying occurred. These plants will need to be bagged and disposed of in the trash. Always monitor sprayed sites and pull any new plants that you find. If you choose to use herbicides, always read the entire label and carefully follow the instructions. Products that contain glyphosate (examples: Round UpTM for upland sites, RodeoTM or AquamasterTM for use near water) or triclopyr (examples: Garlon3aTM or Renovate 3TM) can be used to control garlic mustard. Adhere to the label requirements for application, mixing, and loading setbacks from wells, perennial and intermittent streams and rivers, and other water bodies. Always wear appropriate protective clothing and gear. Lucas Nipp, one of our senior conservation technicians, surveys an area where garlic mustard is spreading. If you think you have found this plant, please report it immediately. This plant is on our EDRR list, and we provide free control in select areas. Report a sighting! Unfortunately, due to the abundance of this species we cannot offer free control everywhere. 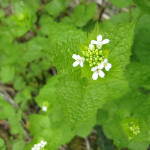 Garlic mustard is already widespread in parts of Corbett, Springdale and Troutdale. In these areas our goal is to contain this species to areas where it is already widespread. Please report this weed if found and we will determine whether your sighting was in a high priority treatment area or within a containment zone boundary. Disclaimer: This page is a basic guide and assumes no liability toward product efficacy, loss of non-targeted plants, or personal safety issues. Always follow label instructions, wear proper safety gear, and avoid herbicide drift. If in doubt as to control practices, consult a licensed treatment contractor. 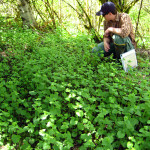 Learn about how EMSWCD is partnering with other groups to contain invasive garlic mustard in the Columbia Gorge!